As a reader of this blog you will probably have heard about the circle technique. I have often described how simple it is and how broadly applicable. For example, you can use it in individual coaching, self-coaching, and team coaching. But you can also use it in training courses. In our training courses, we use the circle technique to let participants work together in a very focused way on improving their skills and knowledge. We do this exercise in three steps. It works as follows. The first step is to give all participants a flip-over sheet and a pile of post-it notes on which progress-focused principles and interventions are written. 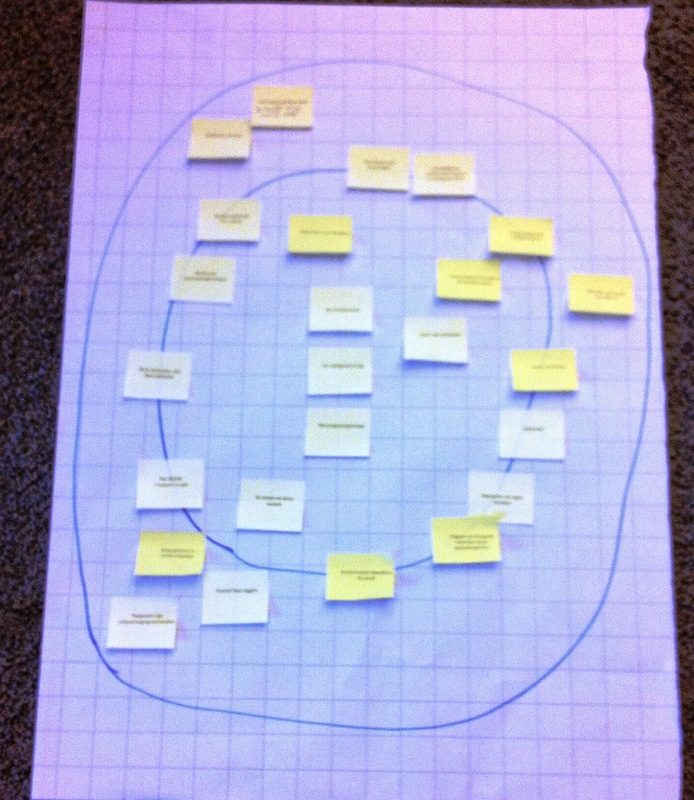 We ask the participants to draw two circles, an inner circle and an outer circle. Then we ask them to to hang each of the post-it notes in either the inner circle or the outer circle. The inner circle means: "I am satisfied now about how I understand and apply this principle/intervention"; the outer circle means: "I want to make progress in how I understand and apply this principle/intervention." When the participants have done this (this might take 10-20 minutes), we proceed to step 2. What is inside your inner circle? What does this intervention/principle precisely mean? In which situations do you already use this? What goes well in working with this principle/intervention? How have you managed to get this intervention/principle into your inner circle? What are you especially satisfied about in the way you use this intervention/principle? Participant often say these interviews are quite useful. By asking questions and trying to answer these questions they gain much insight into what these principles and interventions means and how they can be applied. When the interviews are finished, which may be after 30 minutes or so, step 3 follows. The third step is that the participants form trios. All participants think about which post-it from their outer circle they would first like to be able to move to their inner circle. Then they think about how they would like practice this intervention/principle in their trio. After this, there is 15 minutes of time to practice for each individual. This happens using the deliberate practice approach. Briefly, this means that the participants do not practice complete conversations but little pieces of conversations which they find especially challenging. During practice they get feedback and help from the other two participants and they can practice these little parts multiple times so that they do them better and better. (Also read this). Recently, we have done this sequence of exercises several times and we noticed how participants were very engaged in co-operating, asking questions, explaining things to one another, and practicing. They found it very useful.